Brenda McCall is the owner of DADTH, and is passionate about therapeutic horsemanship for children and young adults with special needs. Brenda is a life long horsewoman who can not imagine a world without horses. 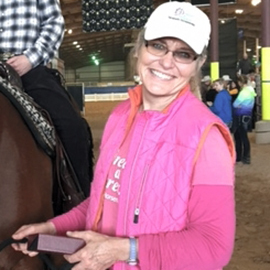 Once a professional horsewoman and active eventing and dressage competitor, Brenda switched careers and became a special education teacher and ABA therapist. In 2007 along with her husband, Michael, they founded Dream a Dream Therapeutic Horsemanship in order to bring the world of horses to those with special needs. Brenda is able to combine her years of horse knowledge with her expertise as a PhD candidate in Special Education to provide a quality program like not other in the Central Texas area. Her research is dedicated to establishing THR as a valid means of specialized therapy for those with autism. DADTH is located in the beautiful Hill Country with a peaceful setting, loving horses and dedicated volunteers.